Whatever the reasons—and despite the obvious hazards of smoking—cigarettes have been a staple of Army life since before World War I. It shouldn’t surprise, then, that Bull Durham, branded as “The Smoke of the Red, White and Blue,” sold all of its cigarette production to the War Department two years later to satisfy U.S. troops’ craving for tobacco “over there.” So great was the urge to smoke to relieve the boredom and tension of war in the trenches General Pershing himself was said to have remarked that cigarettes were more important to our Soldiers than bullets! 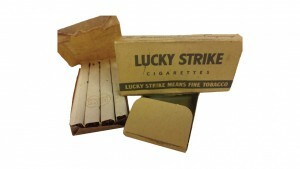 The culture of wartime smoking became even more prominent during World War II. Cigarettes dangled ubiquitously from the lips of battle-weary Soldiers, of cartoon characters in “Stars & Stripes” like Bill Mauldin’s Willy and Joe, and of American wounded laid out on stretchers in movie newsreels, newspapers, and “Life” magazine. One publication went as far as to describe wartime smoking as the “last and only solace of the wounded.” Even President Roosevelt, the commander-in-chief, was frequently pictured smoking, the ever-present cigarette holder clamped firmly in his teeth. Meanwhile, Ike chain-smoked four packs daily, Churchill preferred cigars, and MacArthur drew on his corncob. During World War II and until 1976 a mini-pack of either three or four Old Gold, Chesterfield, Lucky Strike, or Camel cigarettes, along with a fold of waterproof paper matches, was included in the rations issued to our fighting troops. Standard packs of 20 Pall Mall, Philip Morris, Wings, Fatima and other brands were usually supplied by the USO, by major tobacco companies trying to build brand loyalty among the troops, or in care packages from folks back home. 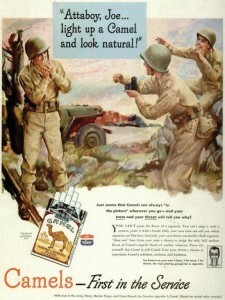 In Korea, Camel sought to establish the brand as the smoke of choice among discriminating infantrymen. With its flip-top box, Marlboro was the most popular brand in Vietnam, despite COMUSMACV General Creighton W. Abrams’ penchant for cigars, a preference dating back to his World War II service as a tank battalion commander. Smoking in the services came under attack in the 1980s. Anti-smoking campaigns were ordered and by 1994 the Pentagon banned smoking in the workplace. By 2002 the Department of Defense (DOD) had fully implemented a 1997 executive order banning smoking in all government-owned, rented, and leased interior spaces. Today, Soldiers continue to smoke, chew, and dip while Congress and DOD are considering a potential ban on sales of tobacco products on military bases and ships.